Wow! Free stuff. Totally cool. It’s my very first giveaway, and I’m so totally excited. 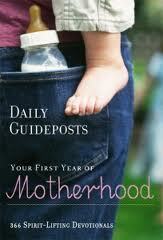 I’m giving away one $30 iTunes gift card and three copies of a Guideposts devotional for new moms. Wait, don’t stop reading! You may not be a new mom, but I can predict one thing for your future: you will encounter a new mom somewhere along the way. Whether she’s your daughter, a friend, a young woman at a crisis pregnancy center – and how handy to have this beautiful hardcover devotional to give to her! So what’s the catch? Nothing. Entering is free. And you can enter three times. To enter once, click here to “like” my new Facebook page for the upcoming release of Pure Love, Pure Life, my purity book for teen girls. It doesn’t matter if you’re a teen girl, a grandmother, a dad or an uncle – it’s all about pulling together for the teens who are out there trying to live it. To enter again, click here to sign up for my new Pure Love, Pure Life blog. I’ll begin posting soon and would love to build a readership. Please let any teen girls in your life know about it as well. To enter the final time, follow me on Twitter at @ElsaKokColopy and @PureLoveLife. Feel free to share this giveaway info on Facebook or Twitter, with any teens in your world, family, neighbors, mailmen, roofers, taxi drivers … you get the idea. I will choose the winners from the people that sign up between today and Sunday at 5:00 p.m. MST. Thanks for being part of my very first giveaway!